SAN DIEGO — Rarely is an invention so unique, so visceral and so simple that in 15 seconds most people who experience it realize it could alter everyday life. Essentially, HSS for the first time does for sound what the laser did for light — intensely focuses and channels it so it can travel great distances without dispersing. In the demo, a technician points a speaker the size of a cereal box at someone standing 100 yards away. Amid the din of the nearby freeway, the technician plays a recording of ice cubes clinking into a glass. To the listener, the sound comes across as if it were through headphones, totally unlike a sound blaring from a distant speaker over oppressive car noise. Take two steps to the side, out of the sound beam, and you hear nothing at all. Step back in, and there it is again. "I am certain that in time, HSS will be used everywhere," says Dionyssis Angelopoulos of Athens, Greece. He read about HSS, came to San Diego to hear it and went back to his Greek company to build it into commercial sound systems. Though the technology is still years from becoming mainstream, HSS could be used to make laptop speakers that blare music to the person in front of the screen, while no one else could hear it. It could allow a grocery store to play audio advertisements that seem to come from, say, the display of Duracell batteries, yet the ad could be heard only by the shopper in front of the display. An HSS-equipped car could play one CD for the parents up front and another for kids in the back. Neither would hear even a whisper of the others' music. The technology is winning believers from Wal-Mart to McDonald's, Fox television, the Los Angeles Police Department, Procter & Gamble, the U.S. Navy and Cirque de Soleil. It is looking into whether HSS could be used to communicate instructions, midact, from the ground to a trapeze artist without the audience hearing. Companies are experimenting with HSS in TVs, rock concerts, museums, war and airport gates. Imagine hearing only your flight's announcements. In 2002, Popular Science magazine awarded HSS the grand prize for inventions. The Segway personal transporter took second. "It offers huge benefits over your standard speaker systems," says Sony executive Simon Beesley, who is working on HSS in commercial settings, such as stores or restaurants. "The technology is in its infancy, but I am sure it will very quickly expand." As it does, HSS will probably rattle the speaker industry, which has been selling a variation of the same technology for nearly 80 years. The impact could be like that of the jet engine on propeller planes or the PC on the mainframe — a major shift that ushers in an era. The ideas behind the technology have been around for decades. But HSS-style speakers had never been more than lab experiments — too costly and unwieldy to become a product. ATC is the first to make it practical, industry experts say. Actually, ATC's technology pops from the mind of Woody Norris, a throwback to old school tinkerers like Thomas Edison or Ben Franklin. He didn't go to college and instead learned basic electronics while in the Air Force. Often boastful about his capabilities, he claims to be something of an inventor savant. On his Web site (www.woodynorris.com), he says, "You know how some people can play the piano, they just pick out notes? I've always had that ability with electronics." Norris, 64, has had some major successes. In the 1960s, he worked out the basic technology behind the sonogram, eventually selling it to a medical company that turned it into the devices used to give expectant mothers a first glimpse of their babies. In the 1980s, Norris created a microphone that picks up a person's voice through the vibrations in the bones in his or her head. He sold that for $1.5 million, and it became the Jabra all-in-one cell phone headsets now on the market. The microphone is actually in the earpiece. Norris formed ATC in 1980 as a vehicle for marketing his inventions. Around 1995, he began working on HSS. "I had the idea probably 20 years ago," he says. Norris got it from color television. A color TV screen has only three colors — red, blue and green— but tricks the eye into seeing other colors by mixing those three in the air as the light travels from the set. That led Norris to consider making sounds by mixing other sounds. He also knew that the waves of ultrasonic sound — a far higher pitch than the ear can detect — can travel farther and stay more focused than waves at lower pitches. So, Norris found a way to make two slightly different ultrasonic waves carry information about a sound, somewhat the way radio waves carry music from an FM station. When the waves encounter a solid object or person, they slow, distort and crash together. The result is the ultrasonic waves re-create the original sound in the air around the object, so humans can hear it. So, sound from a distant HSS speaker seems like it's right at your ears because it's actually being created right at your ears. If you step out of the beam, the waves have nothing to distort and mix them, so the inaudible ultrasonic waves slide silently past. The wave-mixing characteristic of HSS has another effect: Aim an HSS speaker at a solid object like a wall, and the two waves mix at the object. In an ATC demo room, CEO Jim Irish plays music on an HSS speaker and aims the speaker at a back wall. The music seems to come from the wall, not the speaker. Point it at a door, and the music seems to come from the door. The last key property of HSS is its ability to focus sound. The ultrasonic waves don't dissipate, traveling pretty much straight ahead. So sound from an HSS speaker can travel 150 yards without distortion or loss of volume, while anyone outside the path hears nothing. Traditional speakers work very differently. They send out audible sound waves that quickly disperse, filling a room with sound and weakening as they go. So the sound fades as you get farther from the speaker. The properties of HSS are so fundamentally new that Norris predicts "an explosion of invention" around the focusing of sound. How about an HSS megaphone? A beach lifeguard could warn a swimmer who was too far out. Over the crashing of waves, the swimmer would clearly hear the lifeguard's instructions. Norris mischievously warns that such megaphones would have to be banned from pro sports games. "Someone in the stands could use it to razz one player he didn't like," says Norris, who has used HSS to spook neighborhood kids on Halloween. More seriously, the Navy is trying HSS on an aircraft carrier, where the noise of jets can otherwise drown out orders coming from ordinary speakers. Police SWAT teams are interested in the technology's ability to make sound seem like it's coming from a far wall or window. They might be able to project sounds that fool suspects into thinking a raid is coming from another direction, then storm in by surprise. In hospitals, an HSS TV could allow one patient to watch a show without bothering the other patient in the room. In restaurants or clubs, music could be focused at patrons but remain unheard outside the building. Wal-Mart is interested in HSS for store advertising, Sony for everything from TVs to industrial sound systems. As HSS wins converts, ATC is trying to turn it into a business. The company spent the past seven years and $44 million developing the technology. When Irish was hired as CEO earlier this year, he found the company had no sales organization, no ability to mass-produce products, and a long history of not making money on its inventions. It has only 30 employees in a generic office park on San Diego's outskirts. A public company, ATC also has a long list of shareholders who have been losing patience. The stock bounced above $10 a share in 2000 but now lingers around $3. "I'm bringing business standards to a company that needed some reining in," Irish says. He has cut costs, hired a sales staff, cut a deal with a contract manufacturer in Mexico and rushed the prototype R220A HSS speaker into production while developing more refined models. Each R220A — targeted more for industrial use — costs about $600, and ATC expects prices to drop quickly. At first, ATC plans to sell HSS for niche applications and other uses that don't directly challenge the conventional speaker industry. "Later, we'll go after mainstream speakers," Norris says. HSS speakers won't challenge conventional speakers for all uses. In many cases — such as a home stereo, rock concert or movie — the point is to fill the room with sound. HSS makes sense only where focusing sound makes sense. Nobody is debating whether the technology works — it does. And given the enthusiasm at Sony and other companies, HSS will make its way into products of all kinds. In the meantime, suggestions pour into ATC daily. "I just got an e-mail from a blind man," Irish says. The e-mail said HSS could improve the chirping sounds used in crossing signals to guide blind people through intersections. The sound could be channeled only along the crosswalk. "Then you'd know that if you walked out of the sound, you'd walked out of the crosswalk," Irish says, quoting the e-mail. 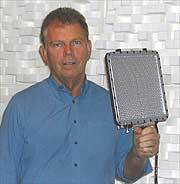 Woody Norris, inventor of ultrasound technology, holds a hypersonic sound speaker. Norris American Technology Corporation has made a device, about the size of a small cookie, which uses a group of quartz_type crystals to radiate sound. Edward G. (Woody) Norris has named his new sound reproduction transducer invention Hypersonic Sound. It has been said, that this new Hypersonic device could be the biggest breakthrough since modern speakers were conceived in 1925. James J. Croft, Vice President of Research and Development at Carver Corporation in Lynnwood, Washington, has been quoted as saying, "If this technology doesn’t have any hidden snags, it will replace normal loudspeakers over night." It has been reported that Carver hopes to launch a speakerless audio system in the Fall of 1997...... ? I'am still waiting. The technology used in Norris’ invention applies to Tartini Tones which are the frequency differences between two original sounds. (Intermodulation). Since the carrying wawes are ultrasonic, they travel a very tight path, thereby projecting sound to a specific location. The frequency difference can theoretically be made totally distortion free from zero to 20kHz. The sound can be likened to a spotlight of narrow beam. Using this "spot" phenomenon, the sound of an airplane could be aimed at the ceiling of a movie theater and travel across it, giving an extraordinary sense of realism to the audience. Today’s speakers are more of a floodlight type, putting sound everywhere instead of only where you want it.